Fresh produce is in Ross Geach’s blood. The Geach family have lived and worked on Trerethern Farm, overlooking the Camel Estuary, for over 130 years and it’s where Ross’ grandfather taught him how to grow vegetables. Following years of learning and experimenting with the land, Padstow Kitchen Garden was opened in 2007 and now supplies our restaurants, and many others with the freshest produce all year round, from his beloved kalettes (a hybrid of kale and Brussel sprouts) to beautiful courgette flowers over the summer months. Before launching Padstow Kitchen Garden, he spent his formative years working as a chef in our kitchens, in Padstow of course, it’s Ross’ home after all. When he was fifteen, he started out washing dishes at our café at the weekend and during school holidays. This experience fuelled his passion for food and after a few years at college he returned to the business to work his way up through the kitchen ranks across our restaurants, up to Head Chef at our café, where he cooked dishes that celebrate Rick’s travels around the Far East. 10 years in the kitchen gave him an understanding of what produce chefs need, the quality they expect and seeing such great ingredients every day inspired him back to the family farm to set up Padstow Kitchen Garden. 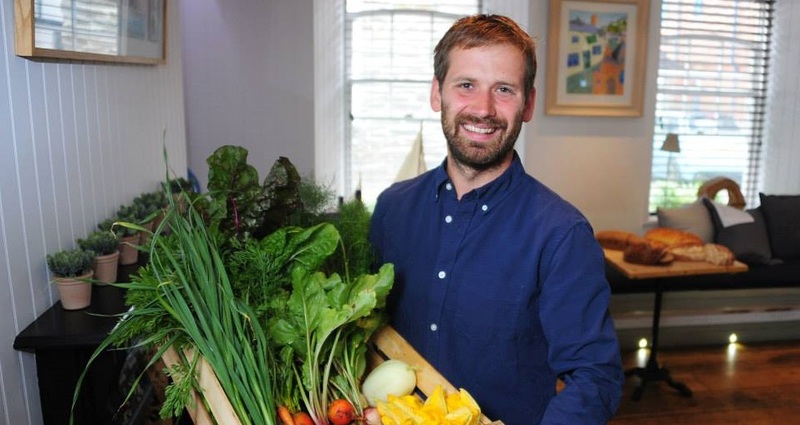 If you’d love to learn more about growing your own vegetables, Ross runs a half day course ‘Field to Fork’ at our cookery school as well as his courses too.